So ff you follow me on Twitter (FOOLS! ), I posted that I was in New York catching a Mets game on Friday night. My wife and I made a quick run east to help out a friend and she said I should get tickets so I can start marking ball parks of the list of places I want to visit. While in New York, with it's super fun traffic, I found a card shop right next to a bookstore. Perfect to not bore the hell out of my wife. Alex's MVP Cards. Tiny shop, though with NY costs, he probably pays 10 grand a month rent or something insane like that. I didn't have much time, so I just dug through a few boxes he had and bought some packs of A&G. Here's some cards that changed time zones. ...and I only needed the one in the middle. Hey - team set builders, am I right? Three for the binders. There is no way Biggio didn't get wrecked on that slide. I still need a few more Opening Day cards of Southpaw Mascot. 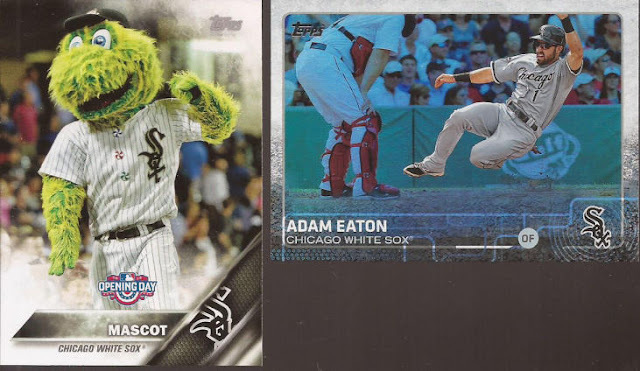 And I thought the Eaton was a refractor Chrome, but it's a foil card. Didn't matter - I need both for the PC. Now I have to find a Chrome refractor. The shop had a Judge rip card from this year's Allen and Ginter for $500. I passed on that and just went with packs. The highlights? YUP!!!! 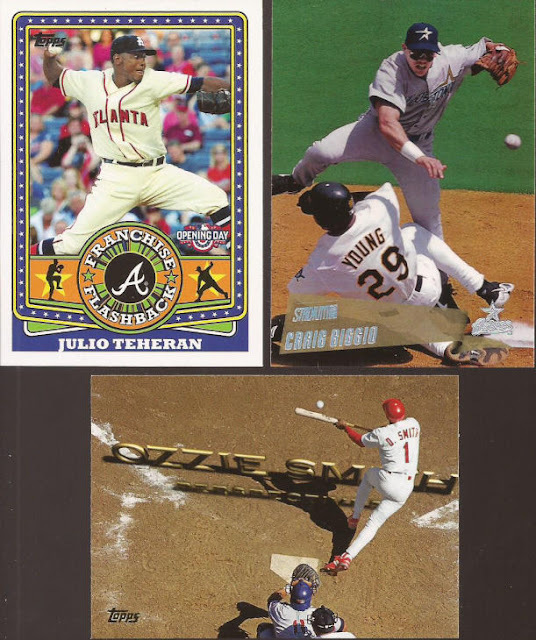 Two of the packs had buybacks. And sure, I am building a frankenset, but these do not belong in A&G. Only put A&G buybacks in A&G packs! Eaton is a nice high number mini for the PC. And some of you may be thinking "Sure, the insert set is nice and all, but that Surrender card is a highlight?" 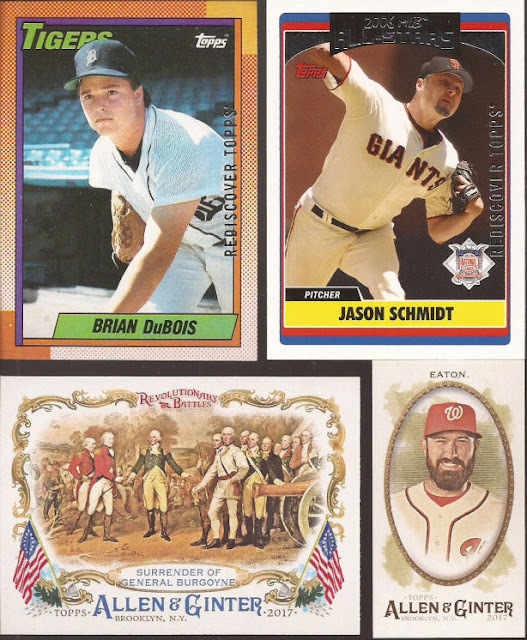 Here's why: I have pulled 4 cards prior to this one from the Revolutionary Battles insert set, and all four of them are the same damn card! #1 - Battle of Lexington. So if you need one, I'm hoarding them. Ha! Love the Tim Wallach at the end. I used to live right there and had a bad experience with the shop. Check out the comments. Wow. Alex sounds like a real treat. hahahahah. AJ, you should go back on every outlet available and leave a bad review. Jeff, glad you got to check off a new park. My sister lives in NYC, last time I was there visiting I stopped by this store. I thought the prices were higher than shopping online, and higher than the shops in MN, but I chalked it up to everything else in NYC being more expensive than I am used to. I met the same nice lady you mentioned, AJ, she was very helpful. I'll keep an eye out for the Battle of Lexington for you, Jeff! Next time you are in NYC (on a weekday, not in winter) try the street vendor on 37th and 6th. I like the pic of the friendly tourist. I thought it might be you but then noticed the smile.